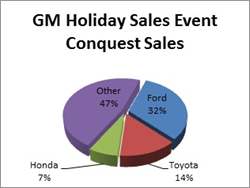 The GM Holiday Sales Event exceeded the company-projected 20 percent sales growth over last year’s promotion. We were able to work with Costco Auto Program to ensure that we offered a diverse vehicle selection and value that resonates with Costco members," said Dan Flores, GM spokesman, "And received great results that included conquests from other brands. Costco Auto Program today announced the GM Holiday Sales Event, which ended Jan. 4, 2016, exceeded the company-projected 20 percent sales growth over last year’s promotion. During this limited-time offer, Costco members purchased 34 percent more vehicles than the previous year’s promotion, totaling approximately 58,000 sales on a variety of models from Chevrolet, Buick, GMC and Cadillac. The offer featured GM Supplier Pricing and all qualifying manufacturer rebates and incentives on a selection of vehicles, including trucks, SUVs, luxury and fuel-efficient models. Additionally, members who made a purchase during the event received a Costco Cash Card for completing a Costco Auto Program member satisfaction survey; Executive Members received a $700 Costco Cash Card, and Gold Star and Business Members received a $300 Costco Cash Card. Gold Star and Business Members also had the option of upgrading their membership to receive the $700 Costco Cash Card. This year, Executive Member interest was more than 60 percent higher than last year. As part of the survey, Costco members were asked if the promotion was a deciding factor in their decision to purchase a GM vehicle versus a competing brand – more than half said they switched brands. According to the data collected, the special offer gained the majority of its conquest sales from comparable Ford, Toyota and Honda models. Costco Auto Program, the only auto-buying service serving Costco members year-round for more than 25 years, reports a continued rise in overall annual sales; accruing a 16.8 percent increase for 2015, with more than 465,000 vehicles purchased or leased through the program. Sales in 2014 were reported at nearly 400,000. The program showcases a streamlined buying experience to Costco members through its network of more than 3,000 hand-selected dealerships nationwide. In addition to saving on a wide selection of makes and models, Costco Auto Program provides a solution for members who want to maintain their current vehicles by offering 15 percent off parts, service and accessories at participating service centers. Also, member advocates are available to support Costco members throughout the purchasing process to further ensure an exceptional vehicle-buying experience. Visit CostcoAuto.com or call 1-855-703-2559 to learn more about the Costco Auto Program. The Costco Auto Program is recognized as a leading member-focused auto-buying program in the industry. The service offers prearranged pricing and a first-class buying experience on new and select pre-owned vehicles, motorcycles and powersports products, as well as discounts on automobile parts, service and accessories to more than 45 million U.S. Costco cardholders. The Costco Auto Program is operated by Affinity Auto Program, which has been managing the program since its inception in 1989. Last year alone, Costco members purchased more than 465,000 vehicles through the program. The Costco Auto Program surveys every member who uses the program to ensure the program continues to meet their high expectations; as a result, more than 96 percent of members surveyed gave it high marks for value, service and overall experience. General Motors Co. (NYSE: GM, TSX: GMM) and its partners produce vehicles in 30 countries, and the company has leadership positions in the world's largest and fastest-growing automotive markets. GM’s brands include Chevrolet and Cadillac, as well as Baojun, Buick, GMC, Holden, Jiefang, Opel, Vauxhall and Wuling. More information on the company and its subsidiaries, including OnStar, a global leader in vehicle safety, security and information services, can be found at http://www.gm.com.